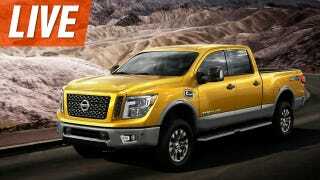 The 2016 Nissan Titan is an answer to a question we're not entirely sure needs answering. So we tied the Titan's chief product head to a chair, filled him full of genuine Thai Red Bull, and glued his palms to a laptop to tell us why Nissan's latest foray into the light-duty pickup market matters. The Titan is ever-so-slightly smaller than the dominant full-sizers, but with a Cummins turbo-diesel V8 and 12,000 pounds of towing capacity. It's here to woo F-150, Ram, and Silverado buyers with more power and better fuel economy, and Rich Miller, the Titan's chief product specialist, is here to tell you why. Ask him anything.